Despite advances in pharmacological and endoscopic management of non-variceal upper gastrointestinal bleeding (NVUGIB), mortality is still relevant. TC-325 (Hemospray-Cook Medical) is a mineral powder with adsorptive properties, designed for endoscopic hemostasis. There are still no comparative trials studying this new hemostatic modality. The objective of this research was to compare the use of TC-325 (associated with epinephrine injection) with the combined technique of endoscopic clipping and epinephrine injection for the treatment of patients with NVUGIB. We conducted a pilot randomized controlled trial with patients that presented NVUGIB with an actively bleeding lesion at the endoscopic evaluation. Patients were randomized either to the Hemospray or Hemoclip group. The randomization list was generated by a computer program and remained unknown throughout the entire trial. All patients underwent second-look endoscopy. Thirty-nine patients were enrolled. Peptic ulcer was the most frequent etiology. Primary hemostasis was achieved in all Hemospray cases and in 90% of Hemoclip group (p = 0.487). 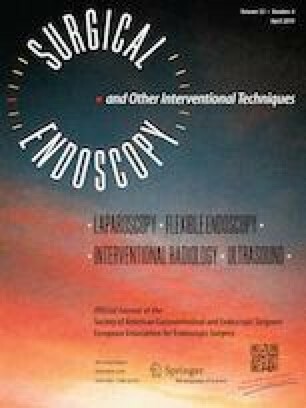 Five patients in Hemospray group underwent an additional hemostatic procedure during second-look endoscopy, while no patient in the Hemoclip group needed it (p = 0.04). Rebleeding, emergency surgery and mortality rates were similar in both groups. No toxicity, allergy events, or gastrointestinal obstruction signs were observed in Hemospray group. TC-325 presents similar hemostatic results when compared with conventional dual therapy for patients with NVUGIB. Hemospray’s excellent primary hemostasis rate certifies it as a valuable tool in arduous situations of severe bleeding or difficult location site. Felipe Iankelevich Baracat, Diogo Turiani Hourneaux de Moura, Vítor Ottoboni Brunaldi, Caio Vinicius Tranquillini, Renato Baracat, Paulo Sakai, and Eduardo Guimarães Hourneaux de Moura declare that they have no conflict of interest or financial ties to disclose.